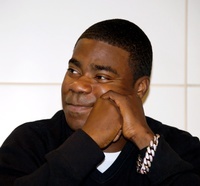 Tracy Jamal Morgan (born November 10, 1968) is an American actor and comedian best known for his eight seasons as a cast member on Saturday Night Live (1996-2003) and for his role as Tracy Jordan in the comedy series 30 Rock (2006-2013). He was nominated for an Emmy Award in 2009 for his work on 30 Rock. He has appeared in numerous films as an actor and voice actor. • Tiffany Haddish says failed Miami show was a "bad day at work"
This webpage uses material from the Wikipedia article "Tracy_Morgan" and is licensed under the GNU Free Documentation License. Reality TV World is not responsible for any errors or omissions the Wikipedia article may contain.